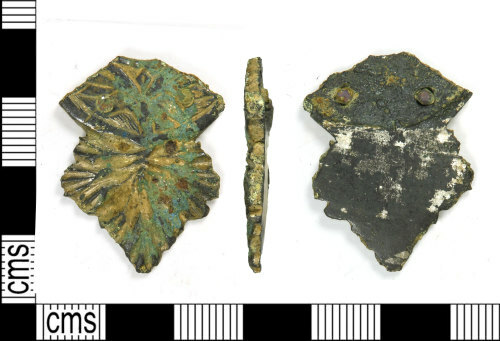 Medieval copper alloy strap end fragment, Length: 30 mm, width: 23 mm, thickness: 3 mm, weight: 5.84 g.
The object consists of a fragment of the lower part of a 'lyre 'shaped strap end. The upper portion is sub rectangular in form but represents the lower portion of a crescent shaped fragment. It has two circular rivets present, sitting side by side, below a fragment of a complete edge, with a raised solid border, and sitting above a curved raised line forming the lower edge of the crescent. The upper part has an area of cross hatched and raised decoration. below the lower curved line is a 'trefoil' shaped projection with a sereis of linear depressions radiating outwards to its edges. The whole surface has traces of gilding. The reverse, which is plain, has traces of silvering all over it.